Do you ever wish your personal nutritionist and fairy godmother could go grocery shopping for you? Today, we’re waving our magic wand to make it happen. 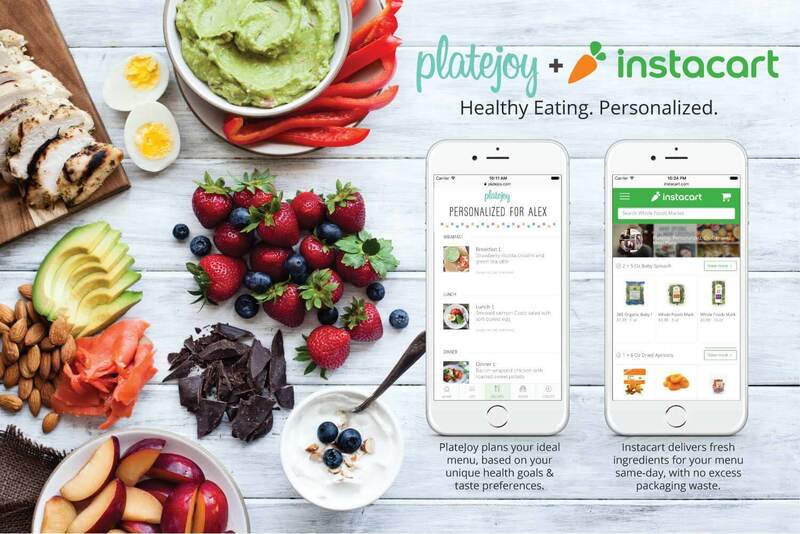 We’re excited to announce same-day grocery delivery via PlateJoy + Instacart , to make healthy eating effortless. Along with your personalized menus, recipes and shopping lists from PlateJoy, you can now get all the ingredients for your healthy week delivered straight to your door in as little as one hour. Create your menu, then open your PlateJoy shopping list on desktop (This feature is not currently available on mobile). Click the handy “Send to Instacart” button. With a single click, this list will be sent to Instacart, where you can confirm ingredients, choose your favorite brands, and add any other staple items you’d like. Ingredients are delivered from your local grocer, without the packaging waste of traditional meal kit delivery services. Instacart delivery is available in 20 metro areas: Atlanta, Austin, Baltimore, Boulder, Boston, Chicago, Denver, Houston, Indianapolis, Los Angeles, Miami, Minneapolis, New York City, Philadelphia, Portland, Orange County, San Francisco, San Jose, Seattle and Washington, D.C. New Instacart users receive their first delivery free! Ready to feel great and eat better? Create your next PlateJoy menu to get started. New Instacart users receive free delivery on their first order!